Come and die your very own scarf. 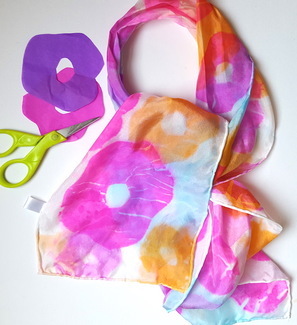 We will be using die paper to create a one of a kind scarf you can gift to a loved one or keep for yourself. We will be using lightweight china silk habotai Silk Scarves 8" x 54". Cost is $10 each for each scarf, 2 people can work on one scarf and just pay $10. This is a great parent/grandparent and child activity. Children under the age of 8 will need accompanied by an adult. Please enter through the west door with ramp. There is a $5 deposit that will go towards your class fee.